arts and design, which operated in Germany from 1919 to 1933. Kabel bears some resemblance to Futura, also released in 1927, however Feder Schrift and Erbar liken to it more so than Futura. This can be noticed in the forms of the characters. The geometric characteristics of Kabel were an experiment of sorts for Koch, who prided himself on his calligraphic ability. Forms of the Kabel characters bass more influence on Expressionism movement in Germany comparing to Modernism movement of that time. The mono-line types, which were simply constructed from straight lines, there circle, and the rectangle, stormed onto the typographical scene in the late 1920s. While Kabel was geometric in form, Koch based its character proportions on his own artistic sensibilities, and perhaps even a creative whim or two. Geometric sans-serif fonts like Futura and Kabel, from the 1920s period, represent most logic-driven letterforms taken of any possibile decoration. The typeface stands out for its balance between elegance and raw energy because of Koch’s extreme passion for infusing the Baroque forms. Variations of the four main styles include Zeppelin, wich was created in 1929 ans is a shadow Kabel. Prisma, which was created between 1928 and 1931, is another variation of Kabel. It is an eye catching display face using fine parallel strokes. Koch’s personal form of this Geometric Sans Serif started at the Bauhaus in 1926 and was eventually designed for the Klingspor Foundry. Wonker states: “The Four Gospels were hand set in 1926 at the printing shop of the Klingspor type foundry and printed for Koch. The typeface Jennen Schrift was used for the first time with this projects. The rights to the original Koch design were actually transferred to the Stempel type foundry. 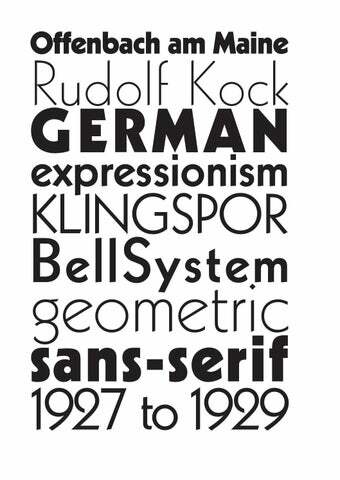 Like many ofthe typefaces that Rudolf Koch designed for printing use, Kabel is a carefully constructed and drawn. Linotype has two versions of Kabel in its library. Kabel has a shorter x-height, with longer ascenders and descenders, making it a bit truer to Koch’s original design than the second version. ITC Kabel was designed by Victor Caruso under a special license from Stempel to revive design for phototypesetting. This version, known in the United States as Cable, has a larger x-height, shorter ascenders and descenders, more weights, and a diamond shaped i-dot. designed “The little ABC book” in 1934.
runes entitled “The Book of Signs”. placed in important spots in the map. a workshop under his guardianship. In 1919 he made his first woodcuts. with sket-ches of flower plants. collaboration of Kredel, Wolpe type for hand setting. â&#x20AC;&#x153;I was very tempted by the exercise of using a compass and straight-edge to create a typeface since, because of my lively interesting type form, I otherwise end up with very personal solutions, and I hoped for once to be free of this. People always think I am looking for a personal style but this is not true. I avoid it whenever I can but not with any success. And I have no succeeded here either. May be that is why this typface has not been given the same recognition as others in Germany because it projects a character in contrast with the spirit of the current style.â&#x20AC;? of sans-serif emerged. These mono-line types, which were simply constructed from straight lines, the circle, and the rectangle, stormed onto the typographical scene. It wasnâ&#x20AC;&#x2122;t an absolutely new idea at that time, since first sans serif faces had appeared in the beginning of the 19th century, but never before this seemingly outlying and exotic trend claimed so much importance as in 1920s and 30s. The Kabel font displayed the core of Klingspor ideology, strictly geometric outline, lacking any decorative elements and showing influence of historical shapes of letters. The negative spaces of letters are more open and broader than most geometric sans-serifs, and stroke weights are more limited. The resulting blend of geometric consistency and exaggerated roundness may be debatable, but it was at least something quite new, and therefore, impressive at that time. the SHAPE of letters The stroke weights of Kabel are more varied than most geometric sans-serifs, and the terminus of vertical strokes are cut to a near eight-degree angle. This has the effect of not quite sitting on the baseline and making for a more animated, less static feeling than Futura. Back to the ch legature thereâ&#x20AC;&#x2122;s a study. Lowercase character e show a link with Carolingian script because the cross bar is on the diagonal. The lowercase a and g are different than the most of the other geometric sans-serif typefaces, they reflect a Roman style influence, but with a modern style. The a is leaning backward and the g has an open descender as a specific preference. One consistent characteristic of Geometric sans serif fonts is the optical circular o. Lowercase b and d are not specular. Uppercase characters are broad and show influence of monumental roman capitals. Capital W is splayed and the G has no terminal.